Many Outdoor Rooms claim to be outdoor kitchens, but fail to hit the mark, missing accessories and features that come standard in any small kitchenette. With the "Clark" Outdoor Fireplace Project with Grill & Pergola you can add an outdoor room you can truly call an outdoor kitchen! The built-ins are numerous and include a smoker, gas grill, refrigerator and stereo, giving you everything you need to cook for dozens of family members, visitors or neighbors! And the fireplace is attractive, with custom stones and custom colors chosen by you to match your home's exterior. All of these special options offered by the "Clark" (this project also includes a masonry firebox, a mantel shelf and storage boxes for wood) sit under an attractive pergola, perfect for growing and hanging plants. So add an Outdoor Fireplace with luxurious and convenient built-ins and special features. 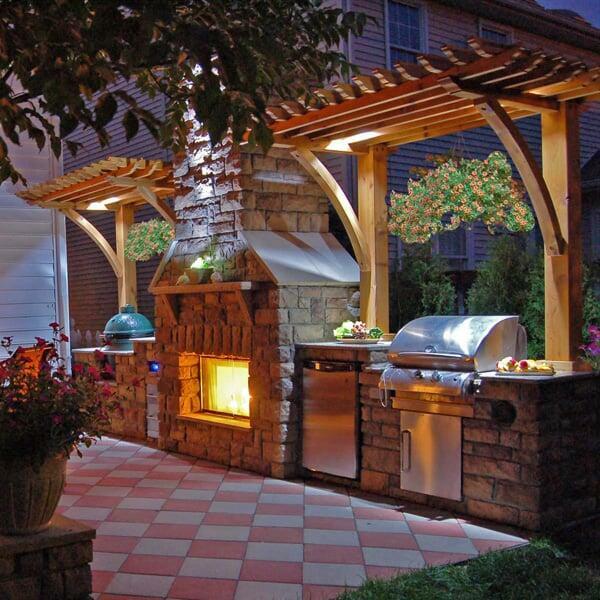 Add the "Clark" Outdoor Fireplace Project to your backyard! Contact us today!